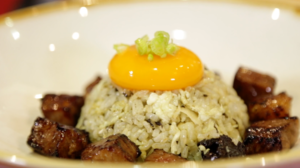 Home SuperSeed Originals Chef's Diary with Chef Eric Teo Chef Eric Teo’s Beef and Olive Rice Recipe! Are you someone who struggles with thinking of a perfect gift for your significant other? Have you ever agonized on how to make it up to your partner after you have done something wrong? Or maybe you just can’t choose what restaurant to go to on date night. Well prepare to stop you stresses, channel your inner Chef Eric and get your pots and pans ready. Because this tasty recipe is sure to charm that special person you have in mind. This recipe is Chef Eric’s Beef and Olive Rice and according to him it is his wife’s favorite. A light dish that is still sure to satisfy. The combination of the fragrance olive fried rice and flavorful beef cubes is definitely one to delight your taste buds! It’s simple to cook and requires few ingredients. Here is how! 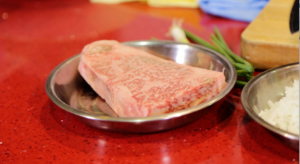 Chef Eric chooses to use the famous Kobe Beef, but you can use any beef that you are most familiar with. Use the chopsticks to mix the Chinese olive vegetables with the rice. 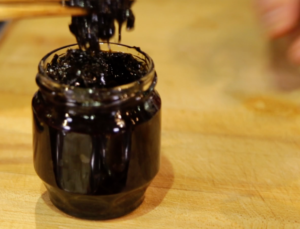 Make sure it is mixed thoroughly, so that the flavour from the olive is spread out. 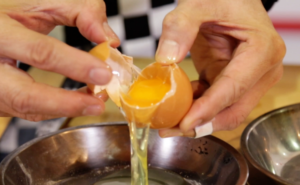 Pour the intact yolk back and forth between the two halves of the shell. Do this until the white drips over the side of the shell. Drop the yolk into another bowl. 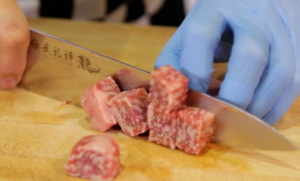 Using the knife cut the beef into ½-1 inch cubes which will make them easy to cook and eat. 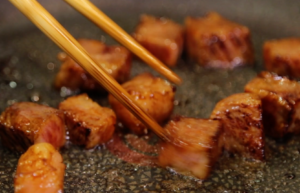 Put your beef cubes into a bowl and pour 2-3 tablespoons of teriyaki sauce. 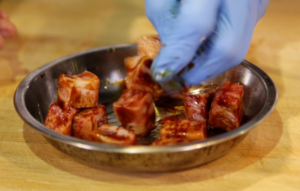 Using your hands mix the beef cubes thoroughly so that they are equally covered in teriyaki sauce. Leave it for 10 min. 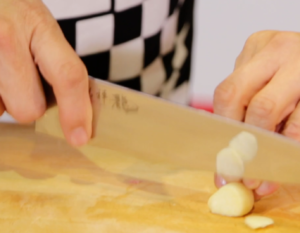 Using your knuckles as a guide, cut thin slices of garlic. Take your chopsticks and use your wrist to make fast, circular motions thoroughly. Until it reaches the color and consistency in the image below. 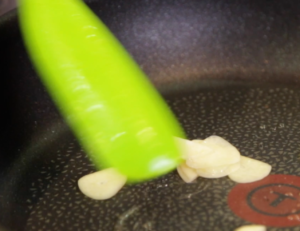 Add 1 to 2 tablespoons of oil and put the garlic slices into the frying pan. Fry the garlic around 2-3 min till the smell is fragrant. 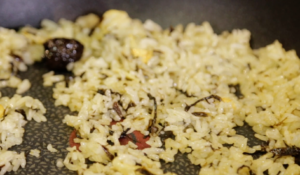 Add the olive mixed rice into the frying pan. 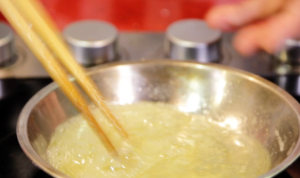 Continue to use the wooden spoon to mix the rice until you see individual rice grains lightly “jumping” from the pan. 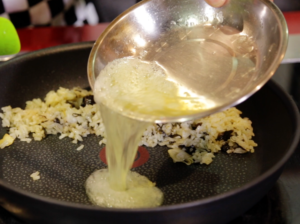 Pour in the mixed egg whites, and scramble it throughout the rice while it cooks for 2 min. Turn off the fire and pour the fried rice intro a separate bowl. Without adding oil, put the beef cubes in the frying pan with medium to high heat. Without adding oil, put the beef cubes in the frying pan with medium to high heat. Use chopsticks to make sure each side of the beef cube is a black-brown color. When the beef is cooked to medium-well put it to a side of the pan, and use a paper towel to clean the oil from the pan. Kobe Beef releases a lot of oil when cooked, by cleaning the oil away it reduces the amount of excess oil you will be eating. Using a spoon place the egg yolk on the rice and chop some spring onions for Garnish, and voila you have cooked Chef Eric’s Beef and Olive rice. Now go share this with your special someone, with Chef Eric’s dish for his special someone. If not, you can always enjoy this warm hearty meal for yourself! When using a non-stick pan, remember to not wash it immediately after you have cooked something. Instead use the paper towel to wipe it, and wait for it to cool down before using soap and water. Check out Chef’s Diary with Chef Eric Teo on our YouTube channel!